John Prescott made his way, by foot, forty-two miles from Lancashire, England, over the Pennine Mountains, the English Alps, to Sowerby, Yorkshire, England in the early 1600s. The trip, more than twelve hours, took him to Jonathan and Grace Fairbanks’ town and the land of Mary Gawkroger Platts, who became his wife. This would be the start of his life’s adventures. The journey began in gently rolling woods and farmland, but as Prescott reached the Pennines, a low mountain range in Northern England, averaging less than 3000 feet above sea level. The uplands became empty rocky moors with few trees, low shrubs, and heather. There would be snow and sharp winds, even in early fall. The traveler would find few way markers. The last leg of the journey took him through the narrowest stretch of the Pennine Mountains. 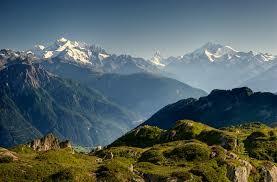 The mountains are not tall, but the inclines were steep and the declines precipitous. Why did John Prescott leave his homeland to go to Sowerby? We don’t know. His route is easier to imagine. There was only one old trade route in that area. It was used by woolen traders to take their wares to the western ports and the farmers to drive cattle inland to markets in Yorkshire. 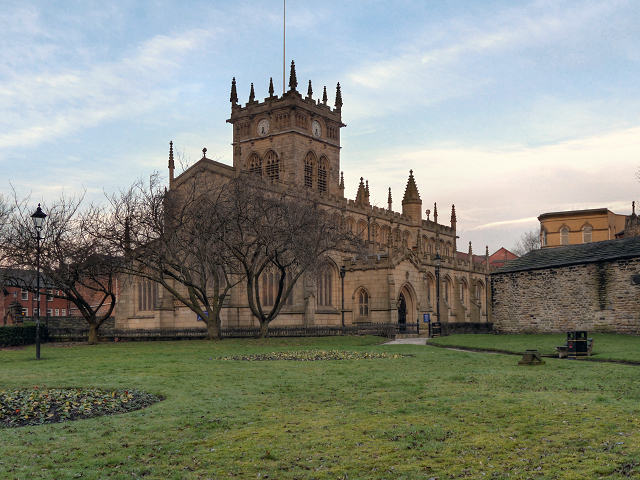 Today, highway M58 follows that route taking us by some of the same churches, buildings and sights of the 1600s. There are biking trails that take you over some of the original lanes or ways. They were not called roads at then. Most transportation in the 1600s were by foot and with the short stocky horses that could live off the meager grasses of the peat and moss covered ground. They were sure footed for the rough travels and had stamina for the mountains. The roads would not accommodate a cart. 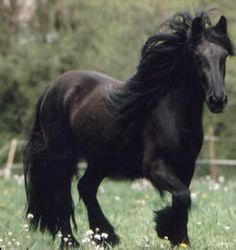 The Galloway horse was the favored breed. Traders used panniers, woven baskets on either side of the horse, to carry their goods. John Prescott might have used the same for his blacksmith tools that he took to Sowerby. Prescott apprenticed as a blacksmith in the coal town, Wigan, four miles southeast of Shevington. It was a settlement and cross roads for the Romans earlier. By the 13th century, it was one of four boroughs, larger walled towns, in Lancashire with buildings of brick and stone. The 13th century All Saints church stands today with its stained glass, monuments from the 14th century, and a parish registry dating from the 1600s. Wigan had weekly markets from the beginning. By the 15th century, it was a center for clock making and weaving of wool, cotton, and linen. 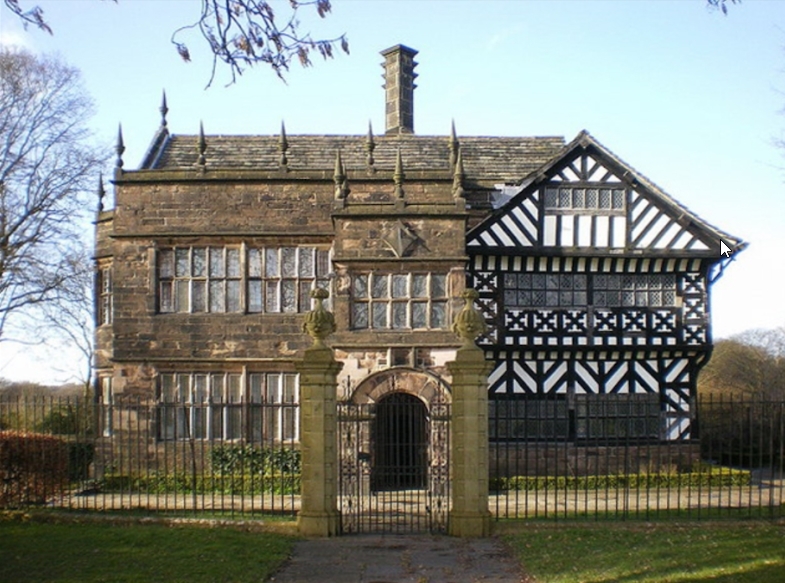 Crook Hall, the former seat of the Catterall Family, still stands two miles south of Wigan. It is a two and a half story timber building of the early 17th century. When Prescott left, there was a population of about 4,000. There were two historic oddities found near Wigan. The first is a burning well on the road south between Wigan and Warrington. The water could be set afire from the coal gas escaping from the ground. There is still an ancient stone ring near Wigan. West Houghton. No doubt he saw the chapel, built in 1552, from a distance. It no longer stands. One of the predominant buildings of that time was Smithhills Hall, built in the 14th-century. A yeoman famer, Brownlow, built another house now known as the Hall i’th’ Wood. Today it is a museum. Even if Prescott started early, apprehension would set in as he felt the steady climb of the next leg of the trip. The sun was now at his back, getting into the Pennines in late afternoon was risky. The hills could be covered with snow, even in August. The wind would blow sharp. 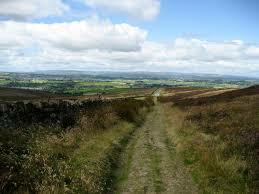 The trail would be less prominent in the moors. Going astray was a danger. Fatigue of a 12 to 16 hour walk would set in. River Irwell and a moat was built by 1400. There were stone walls and turrets with narrow slits for windows to protect against Scottish invasions. Some remains are still visible. Nearby, the Baldingstone House was built around 1615. It was a two story gritstone structure with five mullioned windows. It is still a family home today. Rochdale was the next town. An ancient town with many inns for traders. It lay in the foothills of the Pennines. The trek from here was uphill and not well marked. Daniel Defoe made a detailed account of this journey in the 18th century. Littleborough was only three miles farther. This was once a station on a Roman road. The trail would be clearer for a ways. There Prescott could see the rise to Blackstone Edge and the formidable silhouette of the Aggin Stone, a seven foot pillar carved of gritstone. A cairn, a pile of stone, was already started at the base of the pillar. All around him he could see the barren moors with only an occasional tree, peaty rocky soil, shrubs, heather, and emptiness. When he reached the top of Blackstone Edge, John was 1,549 feet above sea level. That was twice the altitude of Littleborough and about seven times the altitude above Shevington. Today this spot marks the boundary between Lancashire and Yorkshire. The pillar then and now was a way marker. The cairn was a shrine of hope for a safe continued journey. John stood on the top of Blackstone Edge starting a plunge to Ripponden. This was the first of a succession of precipitous declines. Each downhill stride pushed his toes into the front of his shoes. 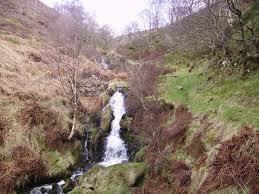 A short respite came in the dale with some body of water to cross and trees that harbored highway men. This scene would play over and over each mile. 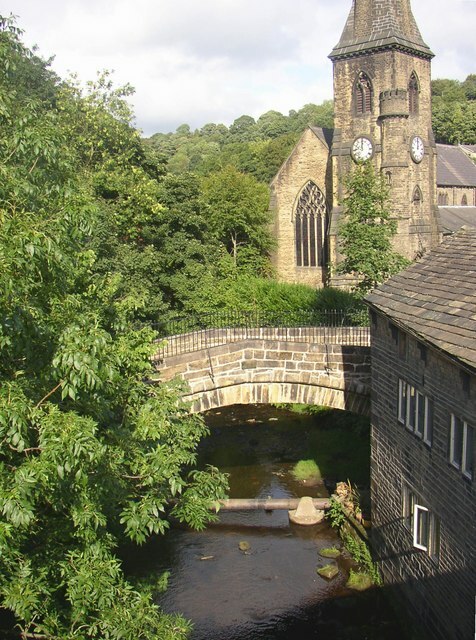 In Ripponden there was the Old Bridge Inn and a narrow packhorse bridge over the River Ryburn. Both greet travelers today. This was the last point before he would hit the blast of winter wind and snow. By now, the light was getting low especially in the valleys. He had about 3 hours to go to reach Sowerby. Luckily he was traversing the Pennines in its narrowest section. If he went all the way to Halifax, four and a half miles, the land would begin to flatten. At Halifax, Prescott would have gone seven and a half miles through the mountains. John Prescott found Sowerby on the downward south side of the mountain. The town was on a level shelf about half way down, well above the flood plain of the Calder River. Small parcels of land were divided by low stone walls, water drains, and tenters (frames to hang wool cloth to dry). Here he found Jonathan and Grace Fairbanks’ home. This is where John Prescott and Mary Gawkroger Platt started their family, buried two children, and finally left for the unknown of the New World.